Slava Tsukerman was born in Moscow, Soviet Union. Best known as the director/writer/producer of a cult classic Liquid Sky, Slava Tsukerman has directed internationally 43 films of different genres. 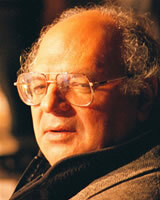 He has received 13 awards from many international film festivals. Tsukerman made his debut at the age of 21, as the director/writer/producer of I Believe in Spring. This first independently made fiction short in the Soviet Union history, won First Prize in the Moscow Amateur Film Festival, was awarded in the Film Festival in Montreal and was successfully released nationally. "It has been a long time since a film of such excellent quality and interest as that made by Tsukerman was shown on Israeli television". "In my opinion, Slava Tsukerman is at present the best film director on Israeli Television". "One of the most outstanding films that had ever appeared on Israeli Television, and possibly the very best.."
Tsukerman lives in New York City, the source of inspiration for his most known picture Liquid Sky, the film which was defined in the fundamental study of contemporary art, The Scandal of Pleasure by Wendy Steiner, as the "concise presentation of postmodern concerns". Liquid Sky is described by TV GUIDE FILM & VIDEO COMPANION as "Outrageous fun. One of the more accessible independent features ever made"; and by TLA GUIDE as "One of the most original and hallucinatory films in memory. A stunning cultural collage". Liquid Sky has broken box office and duration records in the USA and elsewhere. "Mr. Tsukerman's "Liquid Sky"... presents a vision of the city that is genuinely startling". "New York skyline never looked better". "New York has never been photographed better in a movie". "Mr. Tsukerman... seems to possess a rare and unusual talent..."
"Can a film directed by a Soviet emigre... become the science-fiction smash of the year?.. Slava Tsukerman's Liquid Sky smashed house records during its New York run..."
Not long ago Mr. Tsukerman completed his new American movie Poor Liza, based on a Russian love story of 18th Century. Poor Liza won Grand Prix at the Gatchina Film Festival (Russia, March 2001) and a prize for Best Directing at the Kinotavr Film Festival (April 2001). Undoubtedly, Poor Liza is unlike any other film you have ever seen". At the same time while making his feature films Mr. Tsukerman is involved with producing and directing of numerous documentaries, sponsored films, TV commercials and music videos. His two hour long documentary Stalin's Wife has been released theatrically in US in 2005. If you have the slightest curiosity about the people and the period, "Stalin's Wife" is mandatory viewing. "Stalin's Wife" is a fascinating documentary about an otherwise-forgotten character in history. This is a complete eye-opening document on the Soviet dictator and his long suffering wife. "Stalin's Wife" is as illuminating, trenchant and penetrating as any fiction film. It proves that writer-director Tsukerman doesn't need space aliens in his stories to devise a fascinating picture.